Don Bostick – Director WCS. Bondi Beach. Australia. The sport of skateboarding has seen many changes over the years. Starting out as a way for surfers to keep in shape when there were no waves, it wasn’t long before skateboarding developed its own identity. From steel wheels to urethane wheels, loose ball bearings to modern sealed bearings, flat pieces of oak to laminated concaved kicked tail and kicked noses, wheelies to heel flips, from the streets to skateparks, local contest to World Cup events, Skateboarding has stood the test of 50 years of change and is here to stay. Bowl skating was the first real “modern” skateboard professional competition and it is what elevated skating from its 1960’s gymnastics routines to what we all know and love today; the most dynamic and core of all action sports. There is good reason why bowl skating became so popular; it’s got freeform elements of surfing, the raw energy of pogo’ing at a punk gig and most of all it’s about one of the most enjoyable things to do on the planet! Add World Cup of Skateboarding (WCS) and Frontside Events are very proud to announce a new 5-year relationship starting in 2012 for the expansion of the BOWL-A-RAMATM series. This comes after an already successful 7-year term between skateboarding’s official global body and Australasia’s premiere skateboarding competition in both Bondi and Wellington. BOWL-A-RAMATM is all about showcasing the best elements of Bowl skating – a hybrid of vert and street skating. It gives professional riders a unique platform to express their passion and skills as they fight it out for WCS points and ultimately, a WCS title. This new partnership ensures that BOWL-A-RAMATM continues to be the official Australasian leg in the World Cup of Skateboarding tour. It also provides the opportunity of continued growth and development of both BOWL- A-RAMATM Bondi and BOWL-A-RAMATM Wellington. WCS has granted Frontside Events an extension of the BOWL-A-RAMATM series to other cities. Both WCS and Frontside Events are committed to building the only truly international “bowl” skate comp tour. Frontside Events are currently vetting proposals from many territories throughout the southern hemisphere and Asian region to roll out other BOWL-A-RAMATM stops, as part of its proprietary tour. The fans not only get to see the best pro riders fight it out for WCS points but also enjoy a week long festival of cultural events. World Cup Skateboarding is a result of the once thriving National Skateboard Association in the United States. Focusing on the professional skateboarder, WCS has grown the pro tour since 1994 from 3 events to over 20 events a year which have included such countries as the United States, Canada, England, Germany, Czech Republic, France, Spain, Switzerland, Australia, Malaysia, China, Korea, Dubai, Mexico and Brazil. In 2000, WCS started maintaining a World Ranking System for Street and Vert. That same year with the advent of many concrete skateparks being built around the country, the Concrete Challenge series kicked off in Colorado. The 2 event series paved the way for an International Bowl Series and World Ranking a few years later in 2004 with competitions in France, Austria and several states in America. In 2006, the Bondi Bowl a Rama in Australia was added as well as the New Zealand Bowl a Rama 2 years later. For 2010 Bowl Skating is live and growing at an amazing rate as skateparks are being built on a daily basis around the world. the controversial skate laws in the USA. Photo No-Way (R.I.P) circa 1991. 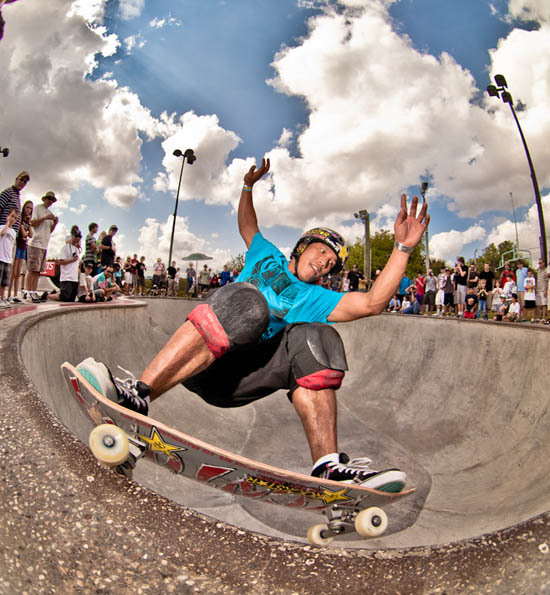 BOWL-A-RAMATM is the biggest concrete event in the Southern Hemisphere. Based on Sydney’s iconic Bondi Beach and Wellington’s Waitangi Park, the event brings the biggest riders in the history of skate to Australasia as well as introduces a week of unbeatable festivities celebrating the culture of skateboarding. Hey, just checkin if the Oregon Trifecta is August 5 - 7 or Aug 26 - 28? WCS webpage posted 5 - 7.